These details have to be verified by a third and independent party. The company did not wait for the publication of the law to set up a publication of environmental indicators and a methodology for data gathering among its 9000 mobile and fixed construction sites. However, it remained for the process to be automated, reliable, fully auditable and maintainable on a budget. The process was originally based on two forms created with Excel. One Excel template was used to collect local data from the 34 quality, security, and environment facilities across the territory; another Excel template was used to consolidate data sourced from those 34 files. The process was tested in 2008 and 2009, and showed a completely acceptable design. However, the related workload was considerable, as it often occurred that facilities would submit incomplete, noncompliant, or off-schedule contributions. The Vinci corporate designers of the template had already used Excel at its maximum capacity to secure data entry, but they could not prevent incorrect data entry. It seemed clear to us that we would have to raise the facilities awareness of the global benefit of the data gathering process, so that they would not consider it as an extra workload that would only ease corporate‘s life. None of the QHSE dedicated tools appeared tailored for our context and also required to discard all we already had developed to start from scratch. Going through this market study helped us realize the value of the work we already completed and how appropriate to our needs it was. The difficulties we faced were all related to the gap in the Excel technology, but the spreadsheets we built (data, calculations, charts, business rules) already suited our objectives. I first heard about Gathering Tools when our financial manager recommended it as a solution. Calame Software gave us a demonstration of Gathering Tools and its philosophy matched exactly our context. The existing Excel documents are used as specification. Database connection that would automatically transmit pre-filled documents to our facilities with data related to their perimeter. Automated dashboard generation that would fill our Excel spreadsheets with data from our gathering campaign and other information system sources. The Proof of Concept showed us that Gathering Tools was the solution we needed to preserve what we already had built, to meet our deadline, and to have no change management to deal with. We therefore quickly contracted with Calame Software. As we decided not to get involved into the technical aspect of the development, we followed Calame Software advice and contracted with an integrator. We chose Cogiteam that provided us an expert consultant. The integration was fast. Our IT department provided access to an application server and a database and the consultant developed the project based on our Excel templates and the workflow specification we provided. Most of my work consisted in testing what was delivered by our integrator. 2 months later, we communicated on the project to our QHSE facilities and the production started in September. Now, I mostly focus on the process monitoring: I make sure that each correspondent submits his contribution on time and I validate data. If I miss some minor mistakes that are then spotted by Auditors, the traceability introduced by Gathering Tools allow us to react quickly and precisely. 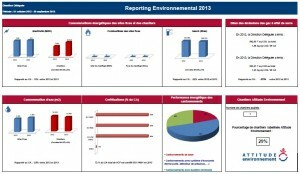 We used Gathering Tools features to provide Excel dashboards for each of our regional entities (indicators evolutions and gas emissions report). In fact, it balances the relation with the correspondents: we ask them to provide data and in return we give them high-value information. We are completely satisfied of Gathering Tools. The project evolves every year and the process is running smoothly: we modify the Excel templates and transmit them directly to the integrator so he can quickly upgrade the application. If I put GT in perspective with the other technical options we considered at the time I arrived, I would say that one of GT’s better assets is its flexibility. In fact, our facilities can choose to make their external subcontractors fill the forms on their behalf using the free GT Answer module. Then, the facilities only have to validate the data before we validate it at a central level. This proves that with Gathering Tools, it is possible to be flexible and secured at the same time. We have some ideas to improve our project. We could connect GT with our accounting tool to improve automation and be more reactive on our reporting processes. Maybe I will bring it to Calame Software’s attention during the next User Club Meeting?